Apricot A Lot! Bags, Bows and Handmade Gifts. Small 0-3mo, Med 3-6mo, and large 6-9mo! But as with much of our items we can make these custom to meet your needs! 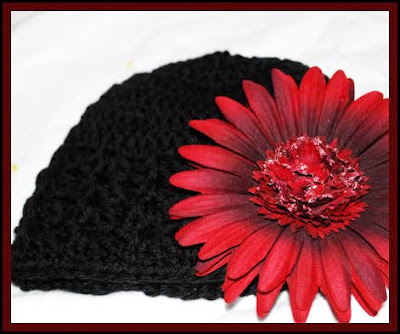 Is this black and deep red combo perfect for Christmas outfits or what?! 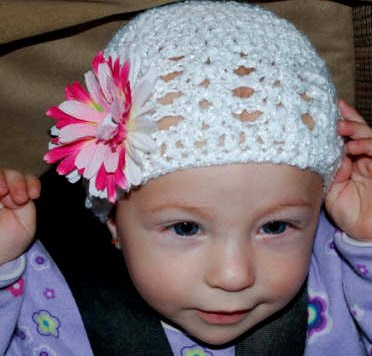 From Naoni's Li'l Miss Luvy custom handmade infant and toddler size beanies with detachable flower. 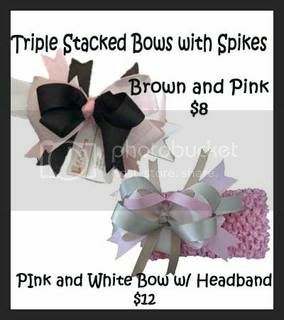 Both items are very versatile and can be worn separate or with other interchangable accessories such as bows, ribbons, headbands, etc... Contact us for pricing and size details! Perfect for tiny babies this winter! They look great with ribbons, bows, corkers and more! And we have some 'non-grandma-made' styles as well! This one stretches from toddler to about 8yrold. What dya think? For a girl or boy? My new Xtra Large Size Bucket Tote. Seriously lots of pockets make up the perfect diaper bag. 7 inch zipper. 3.5 inch cell phone. Running pocket along the bottom inside with 2 7 inch openings and one 5 inch opening. Did I mention it's HUGE? Hey! Let's do some shopping! You design it, I make it up and zip it off! Hobo in black Cartwheel lined w/ Spring Green Cartwheel. Small Tote/handbag Dots and Paisley, really hot right now. 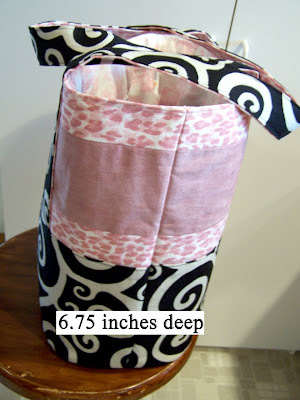 100% Cotton quilter's weight, double interfaced, this bag stands on it's own! and a solid Apple Green accent. Or to a Hobo bag. Perfectly fits a couple diapers and wipes, attaches keys, and even holds a sippy cup. For those times you don't want the whole bag, ya know? Medium Tote in Dark Brown with Turquoise Dots and Stripes and Toile. These Autumn fabrics are waiting to design themselves into your next awesome custom designer bag. A large tote? YES! A hobo? Even better. Introducing...Ba Da Bum! The X-tra Large bucket Tote. I told you that cheetah print would come through. All canvases are Dry Clean Recommended, and coated with a water repellent/stain repellent. All bags now come with a zippered inner pocket and a cell phone pocket! 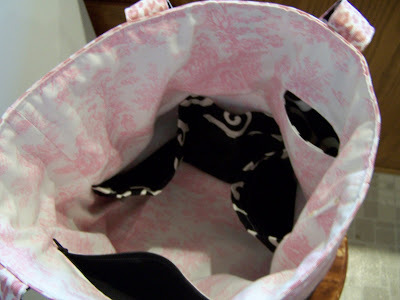 Large Totes and Hobos include a magnetic closure. Design work, (extra time back and forth with emails, and/or ordering additional fabric to meet your custom design is charged at $10/hour). I love doing custom work! Contact us for all your orders. but there's only one of me! Adorable little girl pretties! Perfect for Halloween outfits! Little girls can easily wear one or two bows (clipped together). 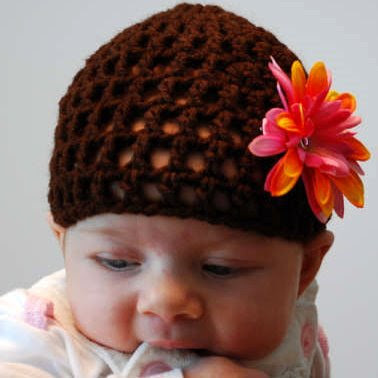 They can be clipped to a coordinating headband and they are great for babies. Mix and match to create the perfect look! Lots of colors and styles to chose from. Custom orders available. Able to match outfits! Pricing ranges from $3 to $10. Contact us for more details and to begin designing. Bows are about 3" across. These are single layer. There are several options with bows from multiple stacking layers to 3, 4, and 5" styles. (See larger bows here). More Corker Bows. Contact us for more ideas and custom orders! Christmas Bows will be available in mid October! 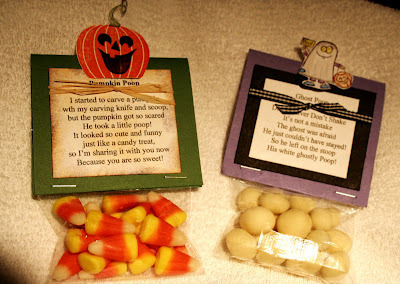 I'm thinking, you need 25 of these little babies for your kid's awesome classroom treats! Contact us for pricing and customizing details. Paired with a red toile, it's funky and dainty and PERFECT! paired with a basket weave strap. Very hip. And second photo is a Medium Tote in a French Bistro/harlequin combination. Greens and Brown could be the new you! I already showed off this one...but It's so great. And so versatile. How about rockin' red? Oh yeah. And for my most favorite bag lately. This is the best part. I did NOT design this. My friend who blogs here did! I love the inspiration I get from your ideas. She wanted toile, and red with the black Cartwheel print...And this was born! It's a medium tote and wow does it shine? Introducing Custom Bows and Headbands. Do you have a gorgeous little girl’s outfit and would like matching hair accessories? Fabulous bows with lots and lots of ribbon! More styles and colors avaliable and custom orders welcome. Bows are approximately 5 inches across and headbands fit newborn up to 10 years old. 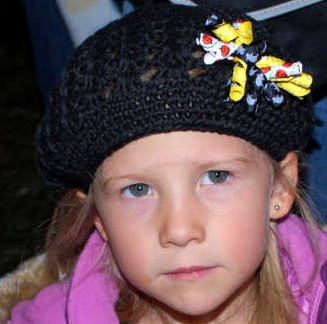 Bows can be made with either alligator clip (easily attach to headbands) or a french clip. Shipping is $3 for US orders. Please contact Naoni for custom orders and ideas! 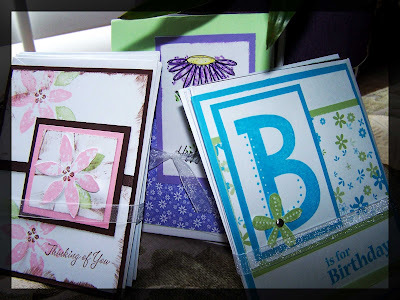 Greeting Cards Created by Michelle. Thank You notes, Halloween ideas, Birthday Greetings...Even Christmas Cards. Order yours today! I just got this fabric in! It is a very bold and large Giraffe print! I paired it with a pink 'suede'-like fabric. Large Tote in giraffe print with pink suede accent. And with a pretty little dainty pink toile lining. A friend of mine designed this little number. The hobo purse and instead of lining it with the pinks. She chose an apple green solid canvas. And I totally love it! Close up of the strappy ties. The hobo purse includes a zipper pocket, a cell phone pocket and a magnetic snap closure. Approx. 11" Tall at the center, 13.5' wide at the center, and 3" deep. Shoulder strap has a 16"-17" drop (can be worn over the shoulder or across the chest and shoulder). I'm getting a red 'suede'-like to try out with the giraffe too! 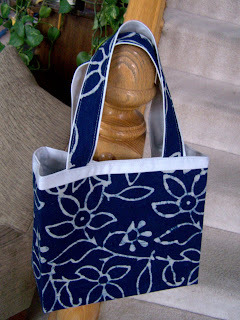 9 1/2" by 12 1/2"
Design your own custom tote. Like Stripes? How about Dots? We've got terrific co-ordinating fabrics to choose from. Choose from Small totes. Med. totes. And large totes. Out of Jessica Jones Designer Fabric. Interior 7inch zipper pocket and cell phone pocket included. Measure 15" by 18" seam to seam. Spriodot Fabric My new favorite! A fabulous lightweight uphostery fabric. The fun is in how you design it? To this... Small tote, inner pocket included. Contact us for Shipping USA. Want the stripes on the bottom 1/3 of bag? And the Dots on the upper 2/3? Wouldn't this make a fabulous Large Tote? Contact us for your custom order. Great for Larger Totes as well as small and medium totes. Also wonderful for the Hobo purse. 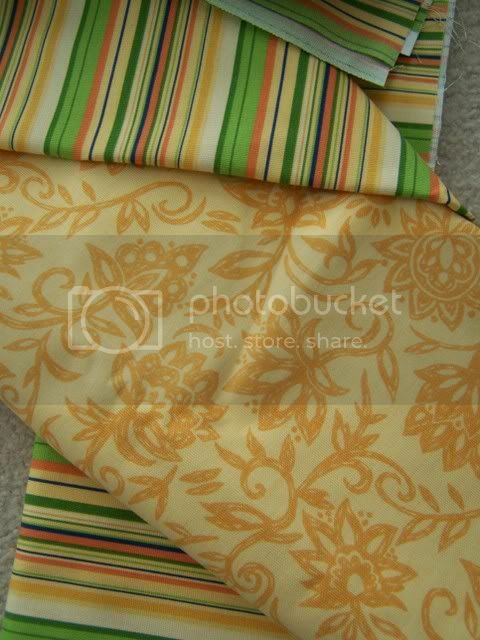 Yellow floral with Yellow/multi Stripe. I know what you're thinking. This seems ho-hum. But honestly when you see the stripe paired with the floral and then the stripe also used as the bag handles it all POPS! See these bags and this bag for examples. 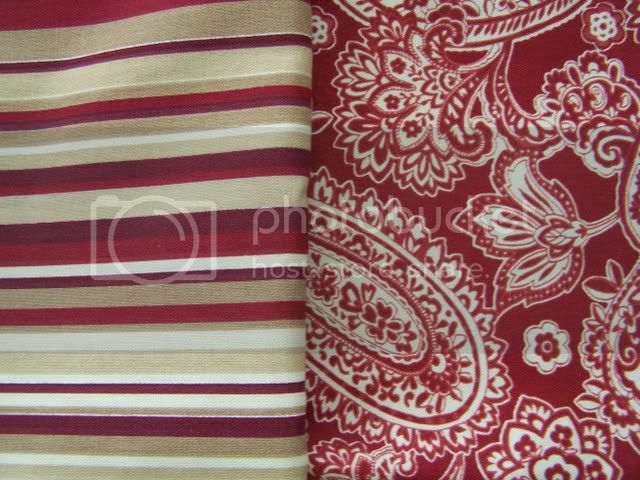 Crimson Red Paisley with multi stripe. Navy blue Floral with Blue multi stripe. All light upholstery fabrics are Dry Clean Recommended and have a water repellent coating. 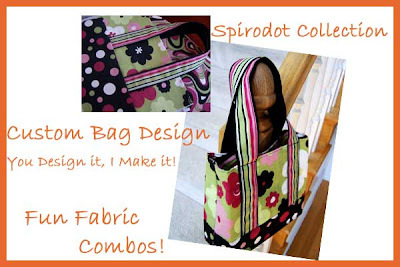 Fabulous for small and medium totes. And for Hobo Purses. 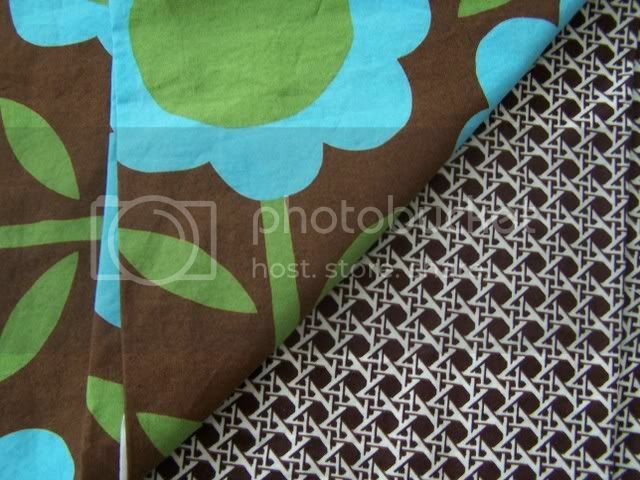 Two Lightweight quilter's cotton fabrics, Spice dot with matching floral and paisley. Great for small ($22) or medium ($27) tote. This green and brown combo is great! Two lightweight quilter's cotton pieces. Designer Fabric. City Girl by Kitty Yoshida collection. Lightweight Quilter's cotton. Designer Fabric. Za Za by Erin Micheal for Michael Miller. Lightweight quilter's cotton. Blacks! Stripes and cool dots. Bling Bling by Michele D'Amore. 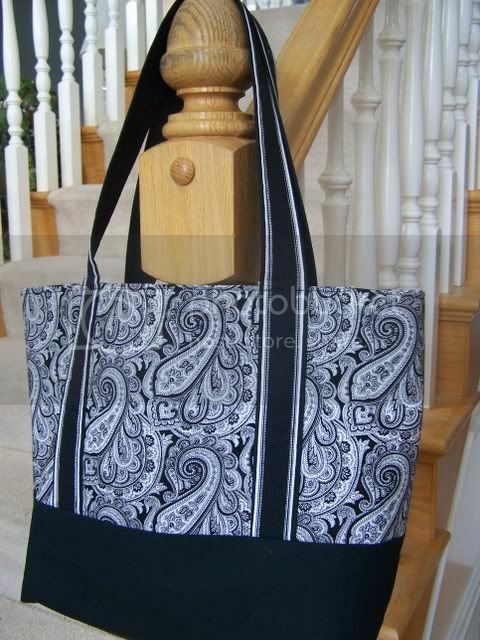 See this great black paisley as well! Green/blue/bright Apple Green is a great with brown basket print as the straps. This flower print is an out of order Japanese print. Order it now, it's the only yard I have left! 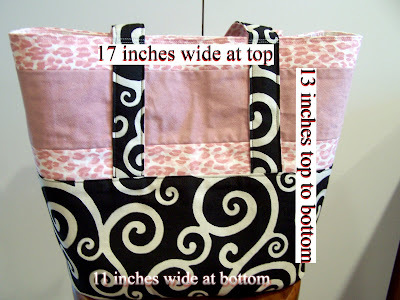 Small totes are fully lined and include an inner cell phone pocket. (Zippered pocket is extra). And they are lined with a heavy pellon. 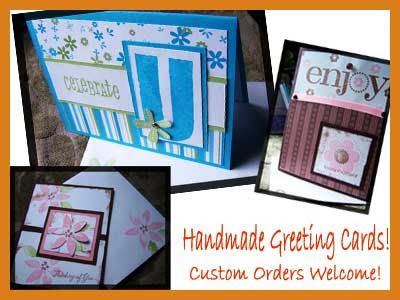 Please contact us for information on custom orders and pricing. Contact us for Shipping and International Orders (we'll get back to you on the shipping cost). (Most fabrics pictured here are avaliable. The items in pictures for example only, may not be avaliable).